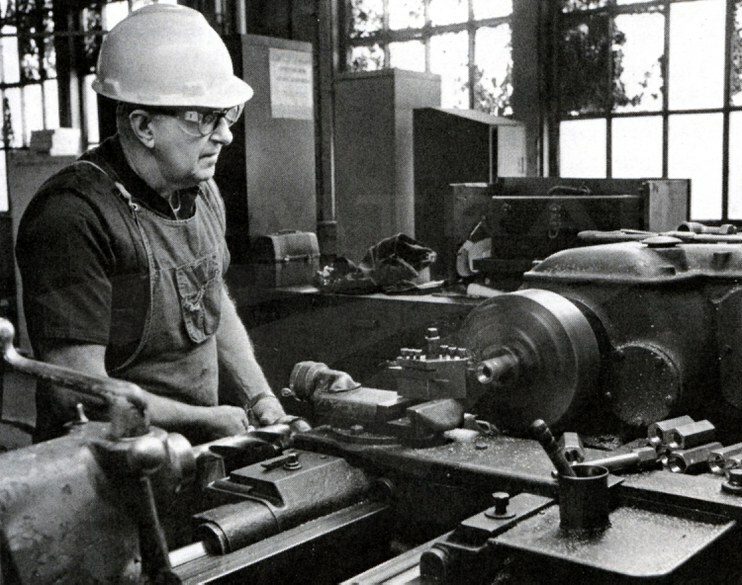 A machinist creates brass nuts on a shop lathe, 1980. Foreman 3 Gary Woods, who oversees the forge shop, started at Beech Grove in January 1974 as an 18 year old. 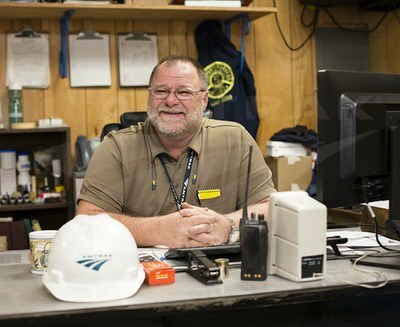 Like many of his colleagues, he belongs to a family with a long railroad history; five generations have worked at Beech Grove. He started out as a carman in the truck shop and later served as the general foreman in coach shop 2 where employees refurbish cars that have been stripped and inspected. Before they return to revenue service, the cars pass through the trim shop where paint and decals are applied, seats installed and other tasks completed. Woods recalls many changes to the complex and its operations, including replacement of the original dirt floors with concrete in the 1990s, the switch from DC to AC power and conversion of machinery from steam power to modern hydraulic systems. Some of the original sledgehammers and other machines were only removed a few years ago, says Woods. Among the jobs completed in the forge shop are the rebuilding of all couplers used on cars and locomotives throughout the national system. With the passing of years, Woods notes that certain skill sets have faded and been replaced by others. For example, numerous blacksmiths used to work at Beech Grove, crafting custom parts for cars and locomotives. Today, boilermakers, who use pre-made parts, are more common around the shops. “I’m not afraid to get out on the floor and show how to get the job done,” Woods says when asked about mentoring new hires. He adds that it’s important to transfer skills and knowledge to the next generation before they are lost. Although formal learning in school is important, longtime employees have developed an intuition that only comes with experience and trial and error. In many cases, it can only be conveyed through one-on-one interaction. Read about Woods's colleague Steve Osburn. The Amtrak History interview with Gary Woods took place on April 2, 2015.